Photography is rarely a solo endeavor. We all have an image in our heads of the lone photographer, striding through the jungles or deserts or back alleys of the unknown, seeking to find and capture something before unseen, but that is far from the truth. The majority of photographic work is done in a community, whether that is the photographers, assistants, writers, and editors of National Geographic; the members of your local photography club; or sharing your latest images with a group of friends and family. If you want to improve your photography, you need to find ways to engage and be challenged by a broader community. You need to be accountable. Photographers are not merely drifting along in space. They flourish in community. There are many different ways to find accountability, and this post will explore just a few broad categories. Make a commitment to try one, or more than one, and I think you will be surprised at how quickly you will see progress in your photography, motivation, and dedication. One way to be accountable is to find a friend or family member who also has an interest or inclination towards photography. Make a plan to get together and go on a photo walk or attend an interesting event. Consider taking time to get together afterwards to compare your favorite images and offer critiques. I always enjoying seeing how each person interprets a similar scene or situation in a different and unique way. Having a photo buddy can also motivate you to get out and do more with your photography, as it is often easier to get up off your couch to meet a friend than to convince yourself to take photographs on your own. This view of the fall colors was taken while on a photo walk with a friend. 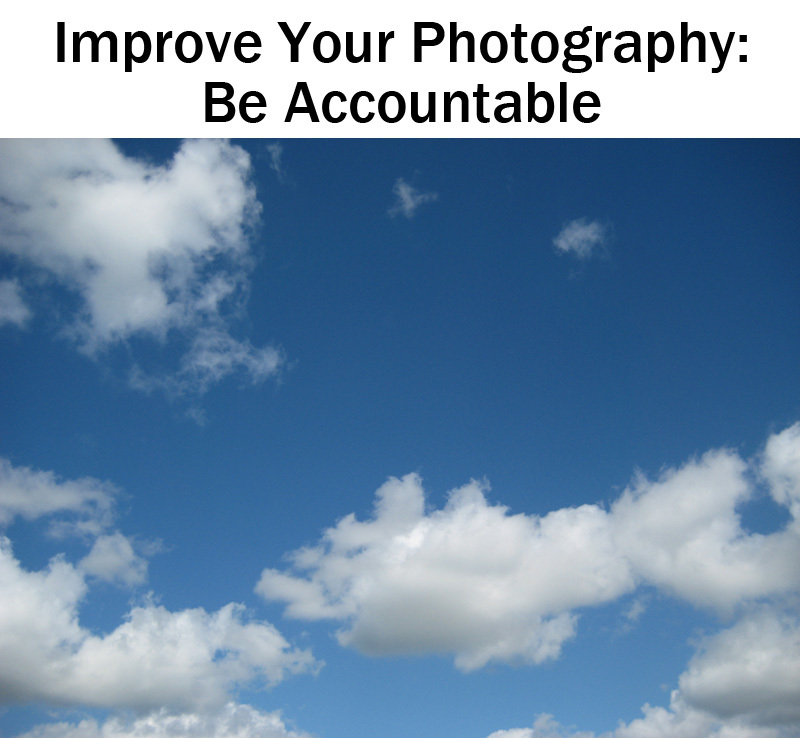 The next step towards accountability is to get involved in your local photography community. Searching meetup.com is a good place to start to find a group near you. You can also visit your local camera store or university to see if they support a photographic group or club. A local photography group is great way to connect to other photographers, receive feedback on your photographs, and find out about photographic opportunities or contests in your area. Other photographers often have great ideas about locations, techniques, and upcoming events. 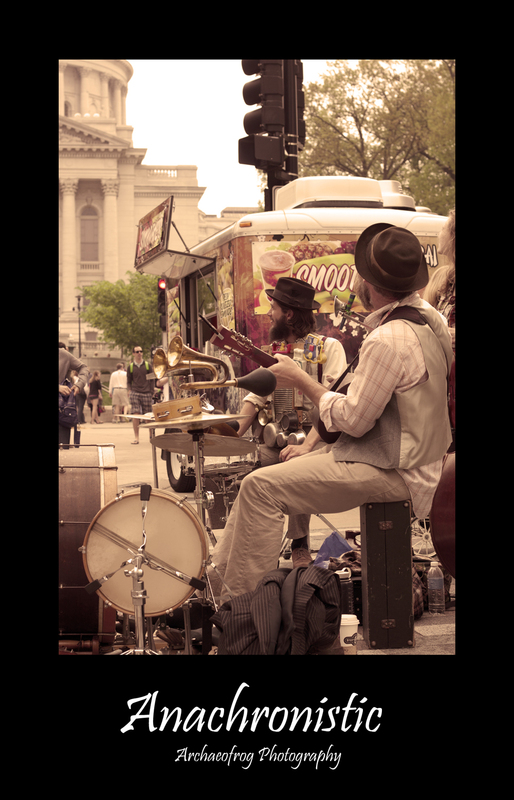 I thought this old timey band with the sepia toning matched with the Scavenger Hunt word, Anachronistic. This photograph was from a scavenger hunt outing with the local photography group. The organizer came up with a list of twelve adjectives, and we had around two hours downtown to try and come up with our favorite image for each adjective. It was a great exercise to visit a familiar place and see it in a different way. There are many different online communities that exist for photographers. Think about your interests and photographic styles and find one that is right for you. Flickr is a large photographic community, with a wide variety of groups specializing in all types and styles of photography. Flickr recently updated its services and provides a free terabyte of data for photo sharing and storage. 365 Project is a web site for photographers interested in committing to a 365 project: taking and posting a photograph every day for a year. The site has a very active community and is a great place to receive thoughtful feedback on your images. Other popular photo community web sites including Facebook, Google+ (which integrates with Picasa albums), Instagram, and Deviant Art. There are also many sites that support photo hosting and sharing but may not provide as much community support and feedback: Shutterfly, Snapfish, PhotoBucket, and many others. It is easy to stick to the familiar with your photography, to build a niche for yourself and do what feels comfortable. But growth requires challenge and risk, and you need to step outside that comfort zone and try new and different things if you want results. One of the best ways to do this is to accept a challenge. One of my favorite challenges, “Get Pushed,” comes from the 365 project. The premise is quite simple, but the impact on my photography has been immense. Each week, all interested participants are randomly paired up. You commit to looking through the last few months of your partner’s photographs to get a sense of what or how they shoot and then use those observations to formulate their challenge for the week. Likewise, your partner will look through your photographs to issue you a challenge. Then, during the course of that week, each person tries to meet the other’s challenge, and the issuer of the challenge provides feedback. One week I was challenged to shoot light trails. It’s that simple. Two people, two challenges. At the end of the week, all of the entries are looked at, a top five are chosen, and the 365 community votes on a favorite. The winner is then responsible for picking the top five for the next week. While hoping to be chosen for the top five and gaining that interest and exposure is always in the back of my mind, I have found that participating in the individual challenges themselves to be the true reward. Being accountable to that one other person is often the kick I need to maintain my motivation, to get out of a photographic slump, and to force myself to learn and experiment with something new. Because of these weekly ‘pushes,’ I’ve tried many types of photography that I might not have, such as street photography, slow sync, smoke photography, and more abstract concepts like thankfulness. For a recent challenge, I was pushed to imitate the photographic style of Julia Margaret Cameron, which was a challenge for me both because of her subjects (portraits) and her style (as she was taking photographs in the 1860s). My final image represented a huge departure from my regular photography, and I learned a lot about lighting and post-processing. You don't have to join a group or a web site to participate in such a challenge. Ask a friend to look through your recent pictures and issue you a challenge. Being accountable to that one other person can be just the push you need to move your photography forward. In order to success as a photographer, you need to find others who can challenge and support you on your photographic journey. Accountability means seeking out feedback, community, and criticism and then using it to grow and challenge yourself. Find a photography buddy, find a photography group, find a photography community. Use these connections to push yourself, to accept challenges, and you may be surprised at where you find yourself!